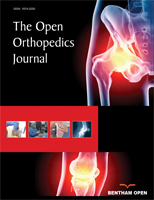 The Open Orthopaedics Journal is an Open Access online journal, which publishes original research article, review articles, letters and guest edited single topic issues in the field of Orthopaedics, aiming at providing the most complete and reliable source of information on current developments in the field. This journal publishes open access reviews on recently published books (both print and electronic) relevant to the journal. Publishers and authors of books are invited to contact our book reviews editor at toorthj@benthamopen.net with book review requests. All submitted books will be reviewed by an independent expert in the field. No page charges will be levied to authors for the publication of book reviews. The journal also considers Supplements/Single topic issues for publication. The title should be precise and brief and must not be more than 120 characters. Authors should avoid the use of non standard abbreviations and question marks in titles.. The title must be written in title case except for articles, conjunctions and prepositions. The editors reserve the right to reject manuscripts that do not comply with the above mentioned requirements. The author will be held responsible for false statements or failure to fulfill the above mentioned requirements. Alfredson H, Bjur D, Thorsen K, Lorentzon R, Sandstrom P. High intratendinous lactate levels in painful chronic Achilles tendinosis. An investigation using microdialysis technique. J Orthop Res 2002; 20(5): 934-8. Bolster MB, Silver RM. In: Clements PJ, Furst DE Ed, Systemic Sclerosis. Philadelphia, USA: Lippincott Williams & Wikins 2004; 121-9. Lozada CJ, Altman RD. Management of osteoarthritis. In: Arthritis and Allied Conditions, Koopman WJ, Ed. Baltimore: Williams and Wilkins 2001. All authors must strictly follow the guidelines below for preparing illustrations for publication in The Open Orthopaedics Journal. If the figures are found to be sub-standard, then the manuscripts will be rejected.